* Senior club appearances and goals counted for the domestic league only and correct as of 05:30, 2 December 2016 (UTC). 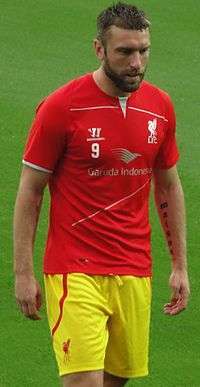 Rickie Lee Lambert (born 16 February 1982) is an English professional footballer who plays as a striker for Championship club Cardiff City. He has won a number of personal awards, including three league Golden Boots. Lambert is known for his large stature and physical performances, drawing comparisons with Southampton legend Matt Le Tissier for his ability in front of goal and penalty record. He began his career at Blackpool, having been previously dropped by Liverpool as a youngster, and played in the Football League with Macclesfield Town, Stockport County, Rochdale, Bristol Rovers before joining Southampton for over £1 million in 2009. Lambert proved a key signing for Southampton, becoming their top scorer as they were promoted to the Championship from League One in 2011 and to the Premier League the following season, scoring 117 goals for the team across all competitions. After a season back at Liverpool, he joined West Bromwich Albion in 2015. On 8 August 2013, Lambert was called up to the England team for the first time, scoring on his England debut at Wembley Stadium in a friendly against Scotland with his first touch. On 12 May 2014, he was named in the England squad for the 2014 FIFA World Cup. Lambert is married to wife Amy and the couple have three children; Carter, Maison and Bella. Their third child, daughter Bella Rose, was born on 8 August 2013, the same day he was called up to the England squad for his debut against Scotland. Lambert was born and brought up in the Westvale area of Kirkby, Merseyside by parents Maureen and Ray. Lambert joined local club Liverpool as a youngster aged 10, but was released when he was 15. Lambert tried out for non-League side Marine, before becoming a trainee with Blackpool in August 1998 at the age of 16. He made his professional debut on 7 August 1999 as a 17-year-old, coming on as a 68th-minute substitute for Andy Couzens in a 2–1 Second Division win against Wrexham at Bloomfield Road. He made two more substitute appearances in the 1999–2000 season, which ended with Blackpool being relegated. The following season Lambert was on a month-to-month contract and struggling to get a place in the reserves. He was released by Steve McMahon in November 2000. Lambert remained a free agent for almost four months, during which time he worked in a beetroot bottling plant to make ends meet, until he was signed by another Third Division club, Macclesfield Town in March 2001, where he made a total of 9 league appearances in the remainder of the 2000–01 season. In the 2001–02 season Lambert became a regular for Macclesfield, with a total of 40 appearances and 10 goals, his first two finishes coming in a 2–2 draw with Forest Green Rovers in the FA Cup first round on 17 November 2001, starting with a penalty. A week later, Lambert scored his first hat-trick in a 4–1 league win against Luton Town at Moss Rose. Macclesfield received a club record transfer fee of £300,000 for Lambert from Second Division side Stockport County, in a move which was completed on 26 April 2002. In his first season in the third-tier, Lambert made a total of 32 appearances in all competitions, although only scored two goals (both in league matches) – in a 2–5 loss against Swindon Town on 18 January 2003, and in a 2–2 draw with former club Blackpool on 22 March 2003. The 2003–04 season would prove to be Lambert's most successful (on a personal) yet, as 40 league appearances yielded 12 goals in a relegation-threatened season, including another against Blackpool and two in a late win against Rushden & Diamonds in the late stages of the season. Lambert was a regular for Stockport at the beginning of the newly restructured 2004–05 season, but following poor team performances and a very real threat of relegation for the club he left in February 2005. Despite now being a relatively accomplished player, Lambert moved down a division to League Two club Rochdale from Stockport on 17 February 2005, the day after his 23rd birthday, for an undisclosed fee. Lambert scored his first goal for the club only nine days after his transfer, in a 1–1 draw with Kidderminster Harriers, but could not help secure promotion for the club. In 2005–06, the striker featured in all 46 of Rochdale's league matches, scoring a total of 22 goals in the campaign, including one in a 3–1 defeat of former club Macclesfield Town. Early into the 2006–07 season, Lambert was purchased for £200,000 from Rochdale by Bristol Rovers in a move finalised on 31 August 2006, transfer deadline day. Despite quickly establishing himself as a regular member of the squad, it took Lambert until November to score his first goal for the club, in the last minute of a 2–0 win over Barnet. The remainder of the season proved to be a disappointment for the forward, although an 86th-minute goal in the last league game of the season against Hartlepool United ultimately sent Bristol Rovers into the League Two Play-offs, from which they won promotion to League One. Lambert also scored the only goal in the League Trophy Southern Area Final in a Bristol derby against local rivals Bristol City, which ultimately sent the team into the final with Doncaster Rovers (which they lost 2–3 after extra time). 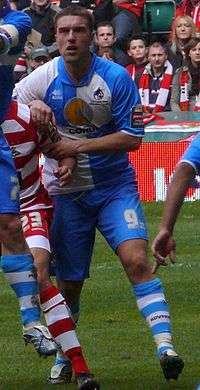 In 2007–08 Lambert appeared in every game of the season for Bristol Rovers, scoring a total of 19 goals in all competitions Lambert proved to be most useful in the FA Cup, scoring goals in both legs of the First Round against Leyton Orient, two goals in the 5–1 Second Round win over Rushden & Diamonds, the only goal in the Fourth Round win against Barnet, and the only goal in the Fifth Round win against Southampton, scored in the last ten minutes of the game. Despite his relatively low scoring record, Lambert finished as the club's top scorer for the season. In the following season, Lambert established himself as one of League One's best players by finishing as the season's joint-top scorer of 29 goals with Swindon Town's Simon Cox – a performance which also resulted in his first inclusion in the PFA League One Team of the Year. Throughout the season, in which Rovers finished a respectable 11th in the league, Lambert put in a number of impressive performances, including scoring all four goals in a 4–2 win against Southend United, and scoring a hat-trick in a 3–0 away win against Hereford United. On 10 August 2009, with a total of 155 appearances and 59 goals for Bristol Rovers, Lambert completed a move worth in excess of £1 million to recently relegated League One club Southampton. The striker scored on his debut for The Saints against Northampton Town on 11 August 2009, and went on to become the club's top scorer for that season with 36 in all competitions. Other notable goals scored by Lambert during the season include one against local rivals Portsmouth in the FA Cup Fifth Round South Coast derby on 13 February 2010 a game his team lost 4-1 at home, a hat-trick against Milton Keynes Dons in the league on 20 March 2010, and a penalty against Carlisle United in the 4–1 League Trophy Final win at Wembley Stadium on 28 March 2010. Southampton finished the season in 7th, one place off the play-offs, despite a 10-point penalty for financial reasons. Following a season in which he performed statistically similarly to his last with Bristol Rovers, Lambert was again named in the PFA Team of the Year for League One, as well as winning the PFA Fans' Player of the Year award for the division. He finished his debut season with Southampton with a total of 36 goals in all competitions, in addition to the goal he scored for Bristol Rovers in the opening match of the season. With 31 League goals, Lambert was the top scorer in English football's top four divisions for the second season in succession. In February 2011, Lambert scored two consecutive braces: the first was in a 2–1 away win at Exeter City, and the second was two penalties in a 4–4 away draw against Peterborough United. He scored his 50th goal for Southampton in a 1–0 victory over Carlisle United on 12 February. He finished the 2010–11 season as the club's top scorer with 21 goals, as they finished second in the league, and won promotion to the Championship. On 1 July 2011, Lambert signed a new deal to keep him at the club until 2014. He scored his first goal of the 2011–12 season with a 25-yard free kick in a 4–1 victory over Torquay United in the League Cup on 9 August. He followed this with a brace in a 5–2 victory at Ipswich Town. He scored a hat-trick against Nottingham Forest in a match which Southampton won 3–2. His 100th league appearance came in a 4–0 victory over Watford, with Lambert netting two penalties. He scored another hat-trick in a 3–0 victory over Brighton & Hove Albion, two of which came from the penalty spot. His 15th and 16th goals of the season came in a 2–2 draw at home to Blackpool, the opener and a late leveller. He scored in a 1–1 draw with south coast rivals Portsmouth. After sitting out for 3 games after receiving a red card, he made his comeback with a goal in a 1–1 draw at Millwall in the FA Cup. His first league goal after his suspension was in the very next match and came from the penalty spot in a 1–1 draw against promotion hopefuls Cardiff City. His 20th goal of the season came in the FA Cup replay against Millwall. He scored his third hat-trick of the season in a 3–0 victory at Watford on 25 February. He continued his impressive first season in the second tier with a thunderous volley against Leeds United at Elland Road on 3 March, which took his tally for the 2011–12 season to 24 in all competitions. On 13 March 2012, Lambert was named the Championship Player of the Year for 2011. He scored his fourth hat-trick of the season in a 3–2 victory at Millwall. While at Southampton, Lambert has not yet missed a penalty; giving him a 100% conversion rate. He scored both goals in a 2–0 victory at Crystal Palace to bring his goal tally to 30 for the season. He was then named in the 2011–12 PFA Championship Team of the Year, along with team mates Adam Lallana and Kelvin Davis. He finished the season with 31 goals, 27 in the league, as Saints clinched promotion to the Premier League, earning him the Southampton Fans' Player of the Season award for the second time in three years. He scored on his first ever Premier League appearance, scoring just minutes after replacing Jay Rodriguez as a substitute against Manchester City. This goal meant that Lambert joined a select group of players who have scored in all four league divisions. He followed this up with the opening goal in a game against Manchester United. He later grabbed two goals in Southampton's first league win of the season, a 4–1 victory over Aston Villa. His 10th Premier League goal came in a 2–2 draw at Chelsea, with Lambert getting the first goal as Southampton came back from 2–0 down. He had only been on the pitch for a matter of minutes. He scored his 100th Southampton goal in a defeat at Newcastle United, which was his 12th goal of the season. On 21 March 2013 Lambert signed a two-year contract extension, keeping him with the Saints until summer 2016. On his 500th career appearance nine days later, he scored a free-kick winner against Chelsea. He ended the season once again as the club's top goal scorer, scoring 15 league goals and featuring in all 38 league games. Lambert started the 2013–14 Premier League season with another goal, a last-minute penalty in a 1–0 win over West Bromwich Albion at the Hawthorns on 17 August 2013. His second of the season, and 200th league goal of his career, came from a 25-yard (23 m) free kick in a 2–0 home victory against Crystal Palace on 28 September. He finished the season with 13 goals in 37 league games. On 2 June 2014, Lambert was confirmed as a Liverpool player after passing a medical, signing a two-year deal for an initial £4 million transfer fee plus add-ons. As he had been released from the club as a teenager, he said "I have always dreamt of playing for Liverpool, but I did kind of think the chance of playing for them had gone. I didn't think the chance would come." He made his competitive debut for the club on 17 August in their first game of the new Premier League season, replacing Philippe Coutinho for the last 14 minutes of a 2–1 win over Southampton at Anfield. On 1 October, Lambert made his debut in European competitions for Liverpool in a 1–0 defeat against Swiss champions FC Basel in the UEFA Champions League group stages. His first goal for Liverpool came at Crystal Palace on 23 November, when he scored in the second minute following a through ball from Adam Lallana. Liverpool went on to lose the match 3–1. Four days later he scored his first goal in European competition, the first equaliser in a 2–2 draw away to Ludogorets Razgrad in the Champions League group stage. As a result, Lambert had scored in the top four divisions in England, the Champions League and for the national team. On 17 January 2015, Lambert scored his second Premier League goal for the club in a win over Aston Villa at Villa Park. On 19 April 2015, Lambert was selected in the Football League team of the decade at the 2015 Football League Awards. On 31 July 2015, Lambert joined West Bromwich Albion on a two-year contract for an undisclosed fee, reported to be in the region of £3 million. Later that same day, Lambert scored twice on his debut in a friendly match against his former side Bristol Rovers. His competitive debut came on 10 August, starting as West Bromwich began the season with a 0–3 home defeat to Manchester City. He scored his first goal for the side on 31 October, netting a consolation from the penalty spot in a 3–2 home defeat by Leicester City. On 31 August 2016, Lambert signed for Cardiff City on a two-year deal for an undisclosed fee, making his debut in a 3–2 defeat to Norwich City on 10 September 2016. His first goal came as the equaliser against Rotherham United on 25 September, and scored the winner six minutes later. Lambert never took a penalty in normal play for his first two clubs, Blackpool and Macclesfield Town. However, on 28 November 2001, he missed in a penalty shoot-out for Macclesfield in an FA Cup first round replay away to Forest Green Rovers, but Macclesfield nonetheless won the shoot-out 11–10. Lambert scored six from six attempts at Stockport County, and five from six attempts for Rochdale. The single miss for Rochdale was against his future club, Bristol Rovers in a 2–0 win on 29 April 2006. Lambert transferred to Rovers and continued to score well in penalties, achieving 13 goals from 14 attempts. His last miss to date occurred on 21 February 2009, against Leicester City in a 1–0 loss. At Southampton, he scored all 34 attempts. His first penalty for Liverpool in a friendly game against Milan was saved by goalkeeper Christian Abbiati. He scored Liverpool's first penalty in their UEFA Europa League round of 32 shoot-out against Beşiktaş, although they went on to lose 5–4. On 8 August 2013, Lambert was called up to the England squad for the first time at the age of 31, on the same day that his wife gave birth to their third child, a daughter, Bella. Six days later, he scored on his England debut with his first touch of the game against Scotland from a header, two minutes and 43 seconds after coming on as a substitute for Wayne Rooney to secure a 3–2 win for his country. Lambert earned a second call-up on 27 August 2013, when Roy Hodgson named him in the England squad to face Moldova and Ukraine in 2014 FIFA World Cup qualifiers. On 6 September 2013, Lambert was handed a start by Roy Hodgson against Moldova at Wembley Stadium. He got his second international goal in this match, another header, making it two goals in two consecutive games. Lambert also contributed the assist for two Danny Welbeck goals in the same game. On 12 May 2014, Lambert was named in the 23-man England squad for the 2014 FIFA World Cup. In a preparation match for the tournament against Ecuador, on 4 June in Miami, he received the ball from Ross Barkley and shot to give England the lead in an eventual 2–2 draw. Lambert made his first appearance at the finals in England's second group game, a 2–1 defeat to Uruguay, replacing Jordan Henderson for the last three minutes as England sought an equaliser. On 8 September 2014, in England's first UEFA Euro 2016 qualifying match against Switzerland, Lambert came on as a 90th-minute substitute and with his first touch assisted Danny Welbeck to seal the 2–0 win in Basel. 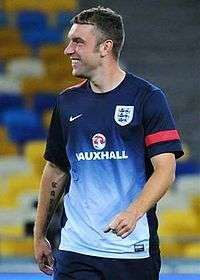 Lambert playing for England against Moldova, a match in which Lambert scored his second international goal. As of match played 18 November 2014. England score listed first, score column indicates score after each Lambert goal. 1 2 Hugman, Barry J., ed. (2010). The PFA Footballers' Who's Who 2010–11. Edinburgh: Mainstream Publishing. p. 243. ISBN 978-1-84596-601-0. ↑ "Rickie Lambert". 11v11.com. AFS Enterprises. Retrieved 2 April 2016. ↑ Wilson, Jeremy (10 February 2013). "Manchester City players challenged to show they have character to react to defeat". The Daily Telegraph. Retrieved 12 February 2013. 1 2 "Rickie Lambert: England call for Southampton striker". BBC Sport. 8 August 2013. Retrieved 8 August 2013. 1 2 "Lambert for England!". Southampton F.C. 8 August 2013. Retrieved 8 August 2013. 1 2 "England World Cup squad 2014: Ross Barkley and Raheem Sterling called up". The Guardian. 12 May 2014. Retrieved 14 May 2014. ↑ "Rickie Lambert back to his day job at Southampton". Daily Express. 15 August 2013. Retrieved 24 August 2013. ↑ "Lambert's wife gives birth on same day as England call-up". Yahoo! Sport. 8 August 2013. Retrieved 24 August 2013. 1 2 Thomas, Joe (16 August 2013). "He's just a nice quiet lad – a true Scouser". Liverpool Echo. Retrieved 13 December 2014. 1 2 Wallace, Sam (13 August 2013). "Rickie Lambert recollects his journey from the beetroot factory to Wembley". The Independent. Retrieved 15 August 2013. ↑ "Rickie Lambert – Southampton". Soccerbase. Centurycomm. Retrieved 30 April 2010. 1 2 "Games played by Rickie Lambert in 1999/2000". Soccerbase. Centurycomm. Retrieved 3 April 2016. ↑ "No grudge match". Blackpool Gazette. 10 December 2011. 1 2 3 "Games played by Rickie Lambert in 2000/2001". Soccerbase. Centurycomm. Retrieved 3 April 2016. 1 2 "Games played by Rickie Lambert in 2001/2002". Soccerbase. Centurycomm. Retrieved 3 April 2016. ↑ "Macclesfield 2–2 F Green". BBC Sport. 17 November 2001. Retrieved 29 April 2015. ↑ "Macclesfield 4–1 Luton". BBC Sport. 24 November 2001. Retrieved 29 April 2015. ↑ "First Team: Richard Lambert". Stockport County F.C. Retrieved 30 April 2010. ↑ "Macclesfield Town all time records". Soccerbase. Centurycomm. Retrieved 30 April 2010. ↑ "Result between Stockport and Swindon on 2003-01-18". Soccerbase. Centurycomm. Retrieved 30 April 2010. ↑ "Result between Stockport and Blackpool on 2003-03-22". Soccerbase. Centurycomm. Retrieved 30 April 2010. ↑ "Result between Stockport & Blackpool on 2003-09-20". Soccerbase. Centurycomm. Retrieved 30 April 2010. ↑ "Result between Stockport & Rushden on 2004-04-03". Soccerbase. Centurycomm. Retrieved 30 April 2010. ↑ "Profiles: Richard Lambert". Rochdale A.F.C. Archived from the original on 4 June 2012. Retrieved 30 April 2010. ↑ "Result between Rochdale & Kidderminster on 2005-02-26". Soccerbase. Centurycomm. Retrieved 30 April 2010. 1 2 "Games played by Rickie Lambert in 2005/2006". Soccerbase. Centurycomm. Retrieved 3 April 2016. ↑ "Result between Macclesfield & Rochdale on 2006-03-11". Soccerbase. Centurycomm. Retrieved 30 April 2010. ↑ "First Team: Richard Lambert". Bristol Rovers F.C. Archived from the original on 2 October 2011. Retrieved 30 April 2010. ↑ "Result between Bristol R & Barnet on 2006-11-26". Soccerbase. Centurycomm. Retrieved 30 April 2010. ↑ "Result between Hartlepool & Bristol R on 2007-05-05". Soccerbase. Centurycomm. Retrieved 30 April 2010. ↑ "Result between Bristol R & Bristol C on 2007-02-27". Soccerbase. Centurycomm. Retrieved 30 April 2010. ↑ "Result between Bristol R & Doncaster on 2007-04-01". Soccerbase. Centurycomm. Retrieved 30 April 2010. 1 2 "Games played by Rickie Lambert in 2007/2008". Soccerbase. Centurycomm. Retrieved 3 April 2016. ↑ "Result between Leyton Orient & Bristol R on 2007-11-10". Soccerbase. Centurycomm. Retrieved 30 April 2010. ↑ "Result between Leyton Orient & Bristol R on 2007-11-27". Soccerbase. Centurycomm. Retrieved 30 April 2010. ↑ "Result between Bristol R & Rushden on 2007-12-01". Soccerbase. Centurycomm. Retrieved 30 April 2010. ↑ "Result between Barnet & Bristol R on 2008-01-26". Soccerbase. Centurycomm. Retrieved 30 April 2010. ↑ "Result between Barnet & Bristol R on 2008-02-16". Soccerbase. Centurycomm. Retrieved 30 April 2010. ↑ "Goalscorers: 2007/08". Bristol Rovers F.C. Archived from the original on 2 October 2011. Retrieved 30 April 2010. ↑ "Divisional Scorers: 2008/09". The Football League. Retrieved 30 April 2010. ↑ "Giggs earns prestigious PFA award". BBC. 26 April 2009. Retrieved 30 April 2010. ↑ "Result between Bristol R & Southend on 2008-10-25". Soccerbase. Centurycomm. Retrieved 30 April 2010. ↑ "Result between Hereford & Bristol R on 2009-03-10". Soccerbase. Centurycomm. Retrieved 30 April 2010. ↑ "1st Team Profiles: Rickie Lambert". Southampton F.C. Retrieved 15 August 2013. ↑ "Result between Southampton & Northampton on 2009-08-11". Soccerbase. Centurycomm. Retrieved 30 April 2010. ↑ "Goalscorers: 2009/10". Southampton F.C. Retrieved 30 April 2010. ↑ "Result between Southampton & Portsmouth on 2010-02-13". Soccerbase. Centurycomm. Retrieved 30 April 2010. ↑ "Result between MK Dons & Southampton on 2010-03-20". Soccerbase. Centurycomm. Retrieved 30 April 2010. ↑ "Result between Carlisle & Southampton on 2010-03-28". Soccerbase. Centurycomm. Retrieved 30 April 2010. ↑ "Rickie claims League One's prize". Sky Sports. 30 April 2010. Retrieved 30 April 2010. ↑ "Lambert double lifts Saints". Sky Sports. 8 May 2010. Retrieved 9 May 2010. ↑ "Exeter 1–2 Southampton". BBC Sport. 1 February 2011. Retrieved 30 May 2014. ↑ "Peterborough 4–4 Southampton". BBC Sport. 5 February 2011. Retrieved 30 May 2014. ↑ "Southampton 1–0 Carlisle". BBC Sport. 12 February 2011. Retrieved 26 November 2011. ↑ "Southampton striker Rickie Lambert signs new deal". BBC Sport. 1 July 2011. Retrieved 26 November 2011. ↑ "Southampton 4–1 Torquay United". Southampton F.C. 9 August 2011. Archived from the original on 15 June 2012. ↑ "Southampton 3 Nottingham Forest 2". Southampton F.C. 10 September 2011. Archived from the original on 22 December 2011. ↑ "Watford 0 Southampton 3". BBC Sport. 25 February 2012. Retrieved 9 March 2012. ↑ "Leeds United 0 Southampton 1". BBC Sport. 3 March 2012. Retrieved 9 March 2012. ↑ "Leeds United vs Southampton". Southampton F.C. 3 March 2012. Archived from the original on 5 March 2012. Retrieved 9 March 2012. ↑ "Rickie Lambert wins Championship player of the year". BBC Sport. 13 March 2012. Retrieved 15 March 2012. ↑ "Player Awards Dinner". Southampton F.C. 5 May 2012. Archived from the original on 7 May 2012. Retrieved 6 May 2012. ↑ "Southampton striker Rickie Lambert signs contract extension until 2016". Sky Sports. 21 March 2013. Retrieved 21 March 2013. ↑ Szczepanik, Nick (31 March 2013). "Southampton 2 Chelsea 1 match report: Saints loosen Blues' grip on top four". The Independent. Retrieved 30 August 2014. ↑ "Lambert caps incredible week with late penalty at The Hawthorns". Daily Mail. 17 August 2013. Retrieved 18 September 2013. ↑ Hassan, Nabil (28 September 2013). "Southampton 2–0 Crystal Palace". BBC Sport. Retrieved 30 August 2014. ↑ Smith, Ben (2 June 2014). "Rickie Lambert completes transfer to Liverpool from Southampton". BBC Sport. Retrieved 2 June 2014. ↑ Chowdhury, Saj (23 November 2014). "Crystal Palace 3–1 Liverpool". BBC Sport. Retrieved 23 November 2014. ↑ Rötters, Matthias (26 November 2014). "Liverpool hit by late Ludogorets leveller". UEFA. Retrieved 26 November 2014. ↑ "Aston Villa 0–2 Liverpool". BBC Sport. 17 January 2015. Retrieved 18 January 2015. ↑ "England striker signs two year deal". West Bromwich Albion F.C. 31 July 2015. Retrieved 31 July 2015. ↑ Whalley, Mike (31 July 2015). "Rickie Lambert completes move to West Brom after year at Liverpool". ESPN FC. Retrieved 3 August 2015. ↑ "Rickie Lambert: West Brom sign striker from Liverpool". BBC Sport. 31 July 2015. Retrieved 31 July 2015. ↑ "New signing nets a brace on debut". West Bromwich Albion F.C. 31 July 2015. Retrieved 1 August 2015. ↑ "West Bromwich 0–3 Man City". BBC Sport. 10 August 2015. Retrieved 10 August 2015. ↑ "West Bromwich 2–3 Leicester". BBC Sport. 1 November 2015. Retrieved 2 November 2015. ↑ "England striker signs two year deal". BBC Sport. 31 August 2016. Retrieved 31 August 2016. ↑ "Norwich City 3–2 Cardiff City". BBC Sport. 10 September 2016. Retrieved 12 September 2016. ↑ "Rotherham United 1–2 Cardiff City". BBC Sport. 25 September 2016. Retrieved 25 September 2016. ↑ "From FA Cup to Namibian Cup: Seven marathon penalty shootouts". BBC Sport. 18 December 2014. Retrieved 30 December 2014. ↑ "Forest Green's penalty woe". BBC Sport. 28 November 2001. Retrieved 30 December 2014. ↑ Gavin Brown (13 November 2013). "Rickie Lambert insists England stars have no World Cup penalty fears | Metro News". Metro. Retrieved 12 May 2014. 1 2 3 "Games played by Rickie Lambert in 2006/2007". Soccerbase. Centurycomm. Retrieved 3 April 2016. ↑ "Southampton's Rickie Lambert: I didn't get England match-ball but everything else that was on offer, I took". Daily Mirror. 18 August 2013. Retrieved 1 December 2014. ↑ Shergold, Adam (3 August 2014). "Rickie Lambert's long-standing penalty scoring record comes to an end as Liverpool striker sees spot-kick saved in Milan friendly". Daily Mail. Retrieved 14 February 2015. ↑ "Lambert: 'A special day'". Southampton F.C. 8 August 2013. Retrieved 8 August 2013. 1 2 Smith, Ben (14 August 2013). 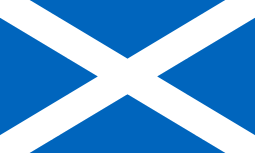 "England 3–2 Scotland". BBC Sport. Retrieved 7 April 2016. ↑ "England squad named". The Football Association. 27 August 2013. Retrieved 27 August 2013. ↑ "Danny Welbeck leads England's rout of Moldova but hit by Ukraine ban". The Guardian. 7 September 2013. Retrieved 18 September 2013. ↑ Burt, Jason (5 June 2014). "England v Ecuador: Ross Barkley's thrilling talent gives Roy Hodgson a selection dilemma". The Daily Telegraph. Retrieved 5 June 2014. ↑ "Welbeck strikes as England win". BBC Sport. 8 September 2014. Retrieved 9 September 2014. ↑ "Games played by Rickie Lambert in 1998/1999". Soccerbase. Centurycomm. Retrieved 3 April 2016. ↑ "Games played by Rickie Lambert in 2002/2003". Soccerbase. Centurycomm. Retrieved 3 April 2016. ↑ "Games played by Rickie Lambert in 2003/2004". Soccerbase. Centurycomm. Retrieved 3 April 2016. 1 2 "Games played by Rickie Lambert in 2004/2005". Soccerbase. Centurycomm. Retrieved 3 April 2016. ↑ "Games played by Rickie Lambert in 2008/2009". Soccerbase. Centurycomm. Retrieved 3 April 2016. 1 2 "Games played by Rickie Lambert in 2009/2010". Soccerbase. Centurycomm. Retrieved 3 April 2016. ↑ "Games played by Rickie Lambert in 2010/2011". Soccerbase. Centurycomm. Retrieved 3 April 2016. ↑ "Games played by Rickie Lambert in 2011/2012". Soccerbase. Centurycomm. Retrieved 3 April 2016. ↑ "Games played by Rickie Lambert in 2012/2013". Soccerbase. Centurycomm. Retrieved 3 April 2016. ↑ "Games played by Rickie Lambert in 2013/2014". Soccerbase. Centurycomm. Retrieved 3 April 2016. ↑ "Games played by Rickie Lambert in 2014/2015". Soccerbase. Centurycomm. Retrieved 3 April 2016. ↑ "Games played by Rickie Lambert in 2015/2016". Soccerbase. Centurycomm. Retrieved 6 September 2016. 1 2 "Games played by Rickie Lambert in 2016/2017". Soccerbase. Centurycomm. Retrieved 3 December 2016. 1 2 "Lambert, Rickie". National Football Teams. Retrieved 7 April 2016. ↑ McNulty, Phil (6 September 2013). "England 4–0 Moldova". BBC Sport. Retrieved 7 April 2016. ↑ McNulty, Phil (4 June 2014). 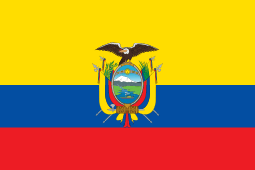 "England 2–2 Ecuador". BBC Sport. Retrieved 7 April 2016. 1 2 3 4 5 6 7 8 9 "England Players: Rickie Lambert". England Football Online. Retrieved 1 December 2014. ↑ "Spurs defender Kyle Walker wins PFA Young Player award". BBC Sport. 22 April 2012. Retrieved 1 December 2014. ↑ Hugman, Barry J., ed. (2009). The PFA Footballers' Who's Who 2009–10. Mainstream Publishing. p. 480. ISBN 978-1-84596-474-0. ↑ "Rooney is PFA player of the year". BBC Sport. 25 April 2010. Retrieved 1 December 2014. ↑ "Huddersfield deny bid for Bristol Rovers striker". Bristol Post. 6 May 2009. Retrieved 4 December 2014. ↑ "English League Leading Goalscorers". Rec.Sport.Soccer Statistics Foundation. Retrieved 4 December 2014. ↑ "The Football League announces its Team of the Decade". The Football League. Retrieved 14 March 2016. Wikimedia Commons has media related to Rickie Lambert.